Chair caster size: you'll need to match the stem and wheel of your current casters. Chair caster wheel: hard and carpeted floors require different wheels for the best performance. Measure your chair caster wheel and stem. Chair caster wheels are sized by the diameter. If your want to match your current wheel size, use a ruler to measure the diameter. However, you can size up or down if you like. Larger wheels will make your chair sit higher; smaller wheels will lower your chair. The C, K, and B stems all have a "grip ring" on the top that will allow you to use this stem to replace a caster stem that is longer than the one you are replacing. However, your new chair caster stems need to match your current casters. Otherwise, you won't be able to attach the casters to your office chair. Note: If you have a wood base to your chair then you would most likely use a W-Stem. Remove a chair caster from your office chair. Measure the length of the stem. It doesn't matter is your stem top is flat or rounded. Either will fit. 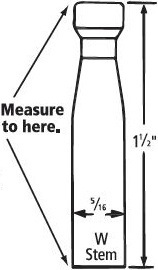 Measure the diameter of the chair stem. Choose the right chair caster style for your floor. Do you have a hardwood floor, or is your office carpeted? Do you have a chair mat? There are two types of chair casters: hard wheel chair casters and soft wheel chair casters. Each works best on specific floor types. Some older chairs have welded caster stems that can't be removed on replaced. In those cases, you may be able to replace broken chair wheels with stemless casters. 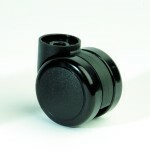 You can special order stemless casters from On Time Supplies by calling 866-501-6055. Our specialty casters only fit 3/8" diameter welded stems up to 1-5/16" long. Use this chart to locate the right item number and give us a call toll-free at 866-501-6055. Please note that the stemless casters ship directly from the manufacturer and will deliver in 3-5 business days and shipping cost is $12.95. If you need more info before purchasing any products mentioned in this article, please contact our sales department instead. If you wish to leave a comment or feedback on this article, please use our leave a comment feature instead. We typically respond to all sales requests within 1-2 business days. We've received your sales help request! We typically respond within 1-2 business days; however, if you need purchasing help immediately, please call us at 1-866-501-6055.